The organisation's policy officer Lindsey Kearton said lack of workplace support could have a "huge impact" on the mental and physical health of those affected. "Small businesses are proportionally better at employing people with disabilities than large businesses - we tend to be more agile, tend to be quite inclusive, perhaps less formal than large businesses," she added. She said the Access to Work scheme - which offers practical support for starting and staying in work - was a good provision. However, Ms Walbey described it as "overly bureaucratic" with not enough businesses knowing they are able to access it. "It would be really good if the Welsh Government developed a national employability strategy so that it was able to concentrate its efforts so everyone can find out the information they need to best support businesses, community and staff - and get the best of out of everybody," she added. "It's massively knocked my confidence," she said. "I've never been out of work or been dismissed from a position, I've never had a disciplinary. "I feel a lot of employers would think twice about employing someone if they had to make adjustments for them. I feel really negative about the whole situation." 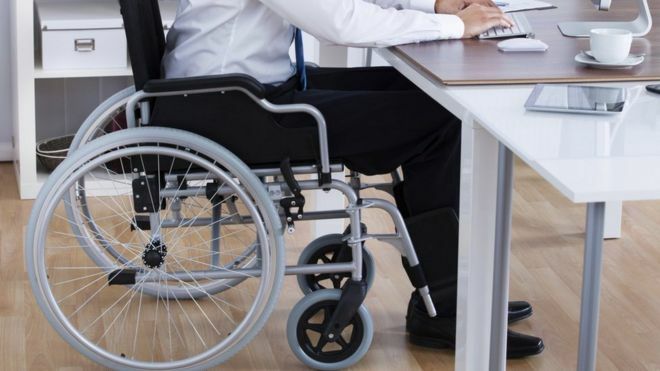 A spokesman for the Department for Work and Pensions said the number of disabled people in work had increased by almost 600,000 since 2013 and it was "committed to going further". "But more needs to be done, which is why we're consulting on a range of ways to improve opportunities for disabled people," the spokesman added. "Business Wales provides a one-stop shop for business information and advice in Wales with the Skills Gateway the single access point for those seeking skills and employability support," he added. "Working with the expert Business Wales strategic board, which includes representation from the Federation of Small Businesses, we will be reviewing the guidance available for businesses to help them make their business more inclusive and ensure it is easily accessible."